The explosively fast-paced “Colombiana” follows Zoe Saldana on a deadly mission to avenge the murder of her parents. The visual look of the movie is defined early on with earthen browns, ochre yellows and desaturated emerald greens as perfectly illustrated in this outdoors shot. Note how not only the bodyguards, but the entire house seem dwarfed by the overbearing automobile, foreshadowing the quick murder of the three men and the impending disaster for the young Cataleya. Slightly further in the same scene Jordi Mollà‘s character tries to appear not overly menacing, as the space between him and Cataleya is lit with soft yellows of the natural daylight. However the much darker space behind his head and the positioning of his face to be to the left of the top-right rule of thirds spot hint at the sinister ulterior motive of his visit. In the next shot of a coroner examination room blue is assimilated into the green to bathe the entire set in an almost monotonous drape of washed out turquoise. The position and alignment of the camera are coupled with a wide-angle lens to distort the depth, enhancing the perceived distance along the Z axis and distancing the viewer from the police officer in charge of investigating a string of murders. Note that despite positioning the three characters directly in the middle of the frame, our eye is guided by the perspective lines towards the far right corner of the room, all the while masking the technician with a deftly placed lighting device. It gives me great pleasure to have Colombiana’s director of photography Romain Lacourbas answer a few questions I had about this movie. Romain: I studied art history for a couple of years in University and then joined a cinema school in Paris. Before my graduation I had the chance to be chosen as a trainee on a feature with the cinematographer Pierre Aïm. I went on to work as camera assistant, focus puller, camera operator and finally DOP [director of photography] for second unit on feature films. At the same time I was also DOP on short films, particulary with Lola Doillon. When she directed her first feature, she call me to be his DOP. It was the beginning of my DOP carrer. 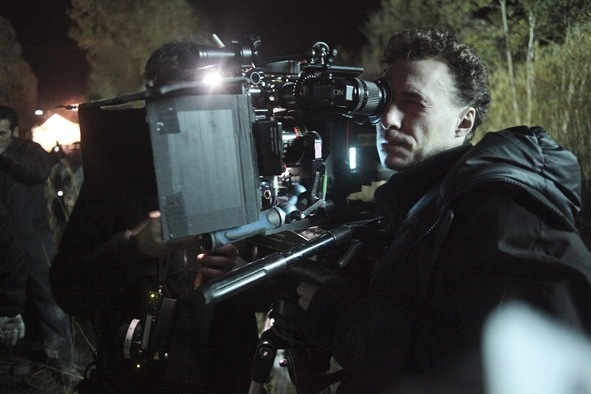 Kirill: In your opinion what are the most important parts of the craft of cinematography? Romain: Listening is the first thing you have to deal with to understand the vision of a director, and to be able to help him/her reaching the visual aspect that is going to serve the script. Finding the visual look according to the script and the director is a really important part of the work. It is also one of the most interesting and challenging parts of pre-production. Being open-minded and capable of changing what was planned, because a shooting is full of surprises, is also necessary. A good knowledge of all technical aspects (optical, lighting, grip) is also necessary to propose solutions during pre-production work as well as on the set. Kirill: How much different it is to work on feature films, commercials and music videos? Romain: Working on a feature film is like doing a marathon. You have to endure. Commercials and music videos are a great pool to meet young directors and they have really interesting artistic confrontation. In the meantime, due to higher budgets commercials give us a chance to test new equipment and new tools. Kirill: Can you describe the process of defining the visual look of “Colombiana” before the shooting started? Romain: Olivier Megaton (the director) and went over a lot of feature references, particularly including Tony Scott’s features. We also made different kinds of tests with different optical setups and filters in order to polish the right look. Kirill: “Colombiana” was shot on film. What drove this choice? Romain: Olivier and I were convinced (and we still are) that digital cameras – unless a huge post-production work is involved – can not render the same highest quality as the film. A film’s image gets instantly more body, character and texture. To reach the same goal digital tools require a bigger intervention in post-production. Moreover, in terms of logistics, such as shooting Colombiana with the rhythms, the number of cascades, and the regular presence of multi-camera setups, might have been a hindrance during the shooting. Kirill: On a related note, what are your thoughts on shooting digital? Romain: I think this is a great way for smaller productions which allows the director to not be concerned about the film dailies. It also opens up many possibilities in regards to special effects. This is a medium that requires a different approach and method of work (compared to the film) but which nevertheless remains really interesting and creative. Kirill: “Colombiana” has a few well defined color palettes. Does a limited color palette affect your choice of lighting and composition? Romain: We tried to assign colors to each place. So, there are few different colors within the same scene but one chosen tone for the set. We used relevant lighting equipment – tungsten, HMI, fluorescent lights, balloons etc – to match the desired effect. Kirill: There are a lot of scenes involving heavy weapons. How much time was spent on set on training and safety, and how did that affect your shooting schedule? Romain: Zoe Saldana was trained a long time before the shooting started by our gunsmith team. 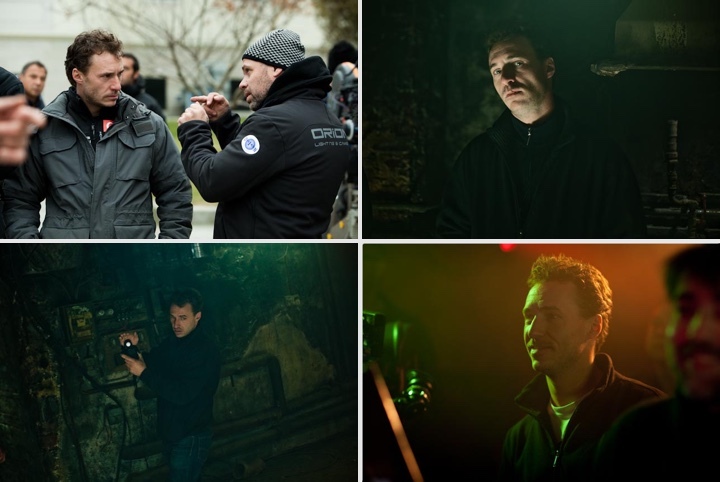 In addition, Christophe Maratier’s team are all seasoned professionals who are used to work on feature films. They are very fast. We never had to wait for the weapons during the shooting. Also, during the preproduction meetings we all knew exactly how we were going to shoot those sequences so that everything was well prepared upstream. Kirill: What was the scale of construction and destruction in the New Orleans house where the final shootout took place? Kirill: The chase after the ten-year old Cataleya through the streets of Bogota was such a thrilling scene. How much time did you spend setting up, shooting and editing it? Romain Lacourbas on the set of “Colombiana”. Kirill: Do you see your craft affected by either shooting or post-converting in 3D? Romain: I didn’t get the chance to shoot in 3D or do post-production conversion to 3D. I would consider my work differently starting from the pre-production when that happens. Kirill: Finally, can you recommend a few of your favorite productions that have particularly impressed you over the years? And here I would like to thank Romain Lacourbas for finding time in his busy schedule shooting “Taken 2” and for graciously agreeing to this interview.